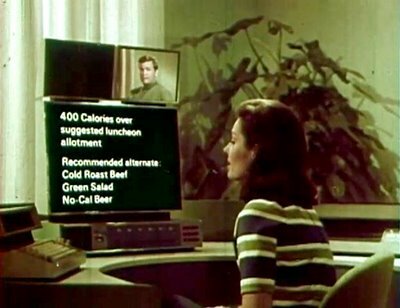 Starling Fitness - Fitness, diet, and health weblog » Lunch of the Future… 1999? Lunch of the Future… 1999? The Philco-Ford Corporation released a movie in 1967 that would show us how our lives would be in 1999. Here is a kitchen scene with a mother, her son and her husband. What will the computer allow the husband to eat? Wife: Earl, how about chicken salad? Cheeseburger with french fries and a nice cold bottle of beer. It suggests roast beef, green salad and no-cal beer, which is apparently a good enough substitute for Earl. We’re living in the year 2007 and there are no flying cars and still no calorie-free beer! The future is NOTHING like they told me it would be!